Manchester City beat Chelsea 6-0 in the Premier League at the top of the Premier League's 26-week Premier League. The highlight of the match is the brilliance of Argentinian striker Sergio Aguero after scoring three goals as a "hat trick" to equalize with Mohammed Salah, the star of Liverpool, top of the league's top scorer with 17 goals. Manchester City's return to the top of the league by 65 points, ahead of Liverpool on goal difference, but the Seitzans fought 27 games against 26 for the Reds, while Chelsea stands at 50 points in sixth place to become a point from Manchester United fourth. * Sergio Aguero became the fifth player to score a hat-trick in two Premier League home matches, the first since Didier Drogba in August 2010. * Sergio Aguero scored 11 hat-tricks in the Premier League, to equalize the Allan Shearer legend of Newcastle. * Sergio Aguero scored 8 goals in the Premier League in 2019, more than any other player. * Sergio Aguero continued to score for goals after scoring his 10th goal against Chelsea in the Premier League to be more than any other player. 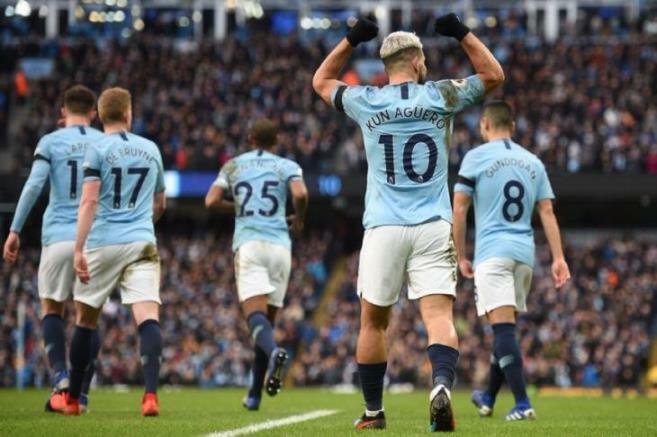 * Aguero is the sixth player in the history of the Premier League with 200 goals for one team in the tournament, behind Wayne Rooney (Manchester United), Ryan Giggs (Manchester United), Thierry Henry (Arsenal), Frank Lampard (Chelsea) and Steven Gerrard (Liverpool). * By scoring goal 160, Sergio Aguero has surpassed Tommy Johnson and Eric Bock (158) to become the top scorer in Manchester City's history. * Rahim Stirling scored his first goal in the Premiership against Chelsea in his 11th game and his 13th game against the Blues. * For the first time, Elkay Göndogan scored five goals in one season of the Premier League, equal to his best in the 2010/11 season when he was at Nuremberg. * Manchester City is the first team to score more than a goal in 15 consecutive home games in the Premier League since Tottenham Hotspur in December 1965.